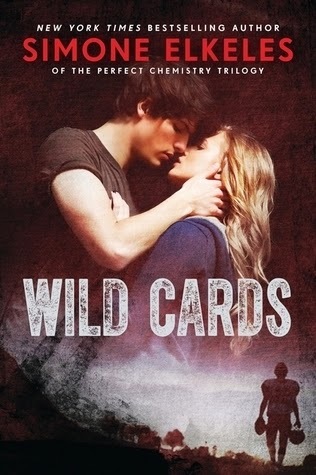 A fresh and fun repackage of Wild Cards, Better Than Perfect launches a romantic new series from NY Times bestselling author Simone Elkeles. Part of a series? Yes, it is book one in the Wild Cards series. I just finished this one yesterday and have thought long and hard about how I wanted to write this review with so many thoughts running through my head. I love Simone Elkeles. I fell in love with her writing with Perfect Chemistry, which was sent to me to review - and I thought I would hate. After that, I devoured the rest of the Perfect Chemistry books, and also the two Paradise books. So it is easy to say that I went into this book with high expectations, and they were somewhat let down. Now, when I go into one of Elkeles books, I expect there to be fluffy not-quite-real romance in them. They are in all her books, and let me tell you, I do enjoy that. I love the fluffy-ness of them. But at the same time, there is always a bit of the book that is so serious that it makes the stories more than just a fluffy romance novel. I was disappointed with the serious aspect of this book. I felt like Elkeles could have gone more into Ashtyn and Derek's issues. They both have problems. I felt like there needed to me more focus on Derek's relationship with his stepmother. In the beginning, he hates her, and then suddenly at the end, he doesn't mind her - but nothing throughout the story led me to believe that anything in their relationship had changed. This is what really bugged me about the book. There needed to be less focus on Derek and Ashtyn's romance, and a little more on how these family issues are magically being solved. Derek and Ashtyn - most of the time - were easy to like. However, as with any Elkeles book, there are times when you just want to throw the book at the wall for the decisions the characters are making. However, there were moments where I just didn't feel like I was connecting with them. Overall, I would still recommend this book to others. It still has a good story in it, even if it was more romance than I preferred. However, if you want to read Elkeles at her best, go for the Perfect Chemistry books or the Paradise books. I completely agree with you. I'm a huge fan of Elkeles' novels and this one didn't quite live up to her standards for me.